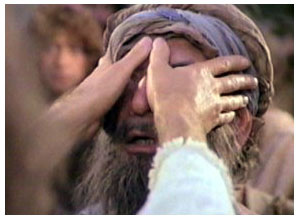 Today’s gospel of Jesus healing the blind man was a blatant reminder of my conversion. The spiritual blindness I shared with the actual blind man in this account is stunning. I can’t help but go into detail…. 25 Then he laid his hands on the man’s eyes again and he saw clearly; he was cured, and he could see everything plainly and distinctly. When I hear these words, I see the “Village” as being the world. Or the worldliness of souls. The evil, the sin the decay of the heart. In order to cure the man, Jesus had to take him OUT of the village. The laying of hands and the spittle is an outward sign of what is needed to cure the sick. That tiny amount of spittle, is actually a tsunami of grace from God. When He asked the man “Can you see anything” and the blind man was could only see people as trees, it meant that he did not have his full vision and could not yet understand what Jesus was doing to him. During this time of my conversion, I was very confused. Having been in the world and understanding things as I did , the wrong way for so long, I could not grasp the reality of what the Holy Spirit was doing to me. I had not yet received the gifts needed to attain understanding. It had only been the first wave of grace and along with it came the test, being, was I going to be worth His time to do this for me. He knew the answer, but I did not. I needed to grow in faith in order to receive the next wave. This is the wave of gifts from the Holy Spirit that keep you focused on our Lord. The desire to do His will and let everything you once knew vanish. The giving up of ones self for the sake of the Truth.. When we get to Jesus telling the man, ” And Jesus sent him home, saying, ‘Do not even go into the village.’ I can identify with this being a warning. Our Lord had just cleaned this man up and did not want him to fall back into the sinful world. There was nothing worth seeing with his “New Eyes” yet. He needed to grow further in faith and trust in the Lord in order to battle the evil he would be soon seeing when he HAD to go back into the village. Once your eyes are opened wide, the things you used to do before your conversion become very troublesome. You no longer find comfort in the world you once knew, but can only find comfort in what is good.